California condors (Gymnogyps californianus) are the heaviest flying bird in North America. Condors are members of New World vultures, Family Cathartidae, and are opportunistic scavengers that feed primarily on large dead mammals such as deer, elk, bighorn sheep, range cattle, and horses. Condors have a wingspan of up to 9 ½ feet, and can weigh up to 25 pounds as adults. Using thermal updrafts, condors can soar and glide up to 50 miles per hour and travel 100 miles or more per day in search of food. California condors are not sexually dimorphic like a majority of raptors, i.e., males and females are identical in size and plumage. Adult condors are primarily black except for bleach white feathers in a triangle-shape pattern beneath their wings (underwing covert feathers). These patches are highly visible when condors are flying overhead and are a key identification characteristic. Adult condors have pinkish-orange featherless heads, ivory colored bills, and the sclera of the eye is red. Juvenile condors are also mostly black with underwing coverts that are mottled gray in color also but triangular shaped like adults. Juvenile condors have dark colored heads until they are about 3 to 4 years old when the head starts to turn pink. The juvenile bill is black and changes to an ivory as the bird matures. Condors are long-lived species with low reproductive rates. They can live up to 60 years in the wild, and become sexually mature at six or seven years of age. Condors mate for life and females lay a single egg, about five inches in length and weighing around 10 ounces, every other year. 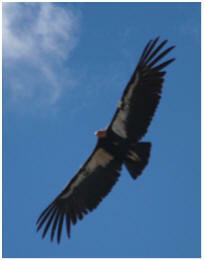 Male and female condors share incubation shifts. Condors are cavity-nesting birds. Most nest sites have been found in caves, on rock ledges, or in tree cavities. Condors do not build nests; instead, the egg is deposited on the floor of the cave, ledge, or tree. The egg hatches after about 56 days of incubation and both parents share responsibilities for feeding the nestling by regurgitation. Young condors fledge at five to six months of age, but may stay in the nesting area for up to one year. In prehistoric times, condors ranged from Canada to Mexico, across the southern United States to Florida, and on the east coast in New York. During this period, condors were a common resident of the Grand Canyon based on bones, feathers and eggshells found in caves where they nested. A dramatic range reduction occurred about 10,000 years ago, coinciding with the late Pleistocene extinction of large mammals such as mastodon, giant sloth, camels, and saber-toothed cats that condors fed on. By the time Europeans arrived in western North America, condors had retreated to a stronghold along the Pacific coast from British Columbia to Baja California. The birds managed to maintain a strong population perhaps due to large sea mammals that washed upon shore, however, the settlement of the west, shooting, poisoning from lead and DDT, egg collecting, and general habitat degradation began to take a heavy toll. Between the mid- 1880s and 1924, there were scattered reports of condors in Arizona with the last sighting near Williams Arizona in 1924. By the late 1930s, all remaining condors were found only in California and by 1982, the total population had dwindled to just 22 birds. The only hope was to begin captive breeding of California condors and to initiate reintroduction of the species. Reintroduction of captive bred condors began in 1992 in California, and 1996 in Arizona. Condors are cavity-nesting species that require caves, ledges, or large trees in order to nest. High perches are necessary for roosting, as well as to create the strong updrafts required for lift into flight. Open grasslands or savannahs are important to condors while searching for food. In Arizona, condors are found at elevations between 2,000-8,000 feet, and the reintroduction site is located in the northern part of the state on Vermilion Cliffs. The Vermilion cliffs are rugged sandstone cliffs located on public land administered by the Bureau of Land Management. These cliffs are located on the Paria Plateau and provide the necessary remoteness, ridges, ledges, and caves favored by condors. The Paria Plateau is typified by Great Basin Conifer Woodland, dominated by juniper (Juniperus spp.) and pinyon (Pinus spp.) Great Basin Desertscrub occurs along the Vermilion Cliffs and is dominated by sagebrush (Artemisia spp.) and rabbitbrush (Chrysothamnus spp.). Species diversity is low, with shrubs occurring more frequently than woodland or forest. Current condor distribution is limited to three major reintroduction sites. These include reserves in California located in Ventura, Santa Barbara, Kern, Monterey and San Luis Obispo counties. In northern Arizona, condors are located primarily near the Vermilion cliffs and Grand Canyon. A third reintroduction area was added in 2002, which is located in a remote area of Baja California, Mexico. To view the condor release site in Arizona, drive north on Highway 89 out of Flagstaff, Arizona. Turn left onto Highway 89A toward Jacob Lake and the North Rim of the Grand Canyon. Drive approximately 40 miles (past Marble Canyon, Vermilion Cliffs, and Cliff Dwellers), turn right onto House Rock Valley Road (BLM Road 1065) just past the House Rock Valley Chain Up Area. Travel approximately 2-3 miles to a condor kiosk and shaded viewing area on the right. Atop the cliffs to your east is the location where condors are released, and a good place to see condors year round. In winter months, condors frequent the Colorado River corridor near Marble Canyon and in summer months, condors are seen frequently at the South Rim of the Grand Canyon. All videos, photographs and copy on this website, www.thecondorfund.org are © 2018 The Condor Fund.